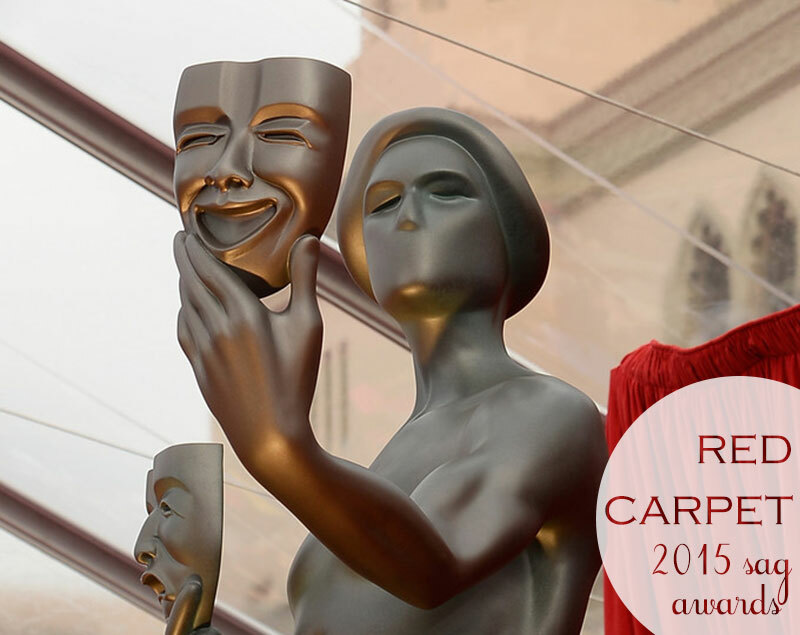 Looking forward to an event might be a losing bet as one could end up watching an endlessly boring Red Carpet like the one rolled out for the 2015 Screen Guild Actors Awards! The beautiful ladies, the talented actors, the acclaimed performances but the oh-so-boring dresses! 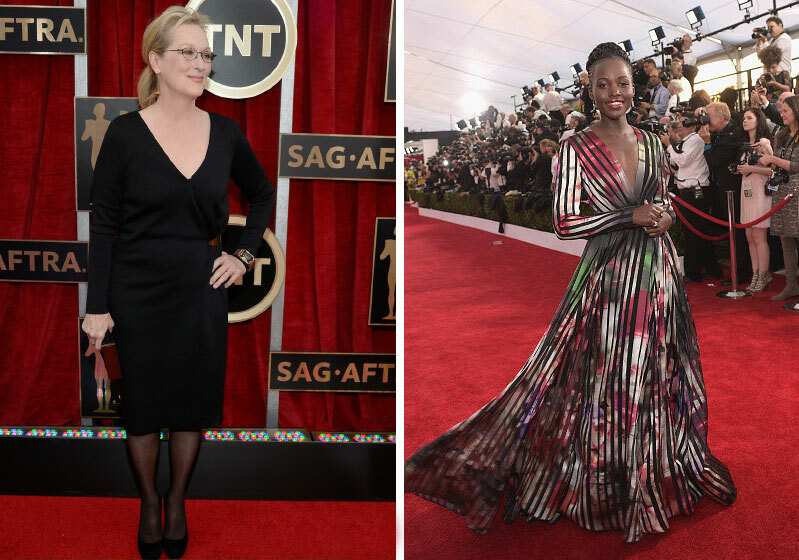 How does one label an event such as the SAG Awards as boring, fashion-wise? 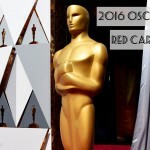 When the best dressed goes to a Lavin black wrap dress as worn by Meryl Streep! 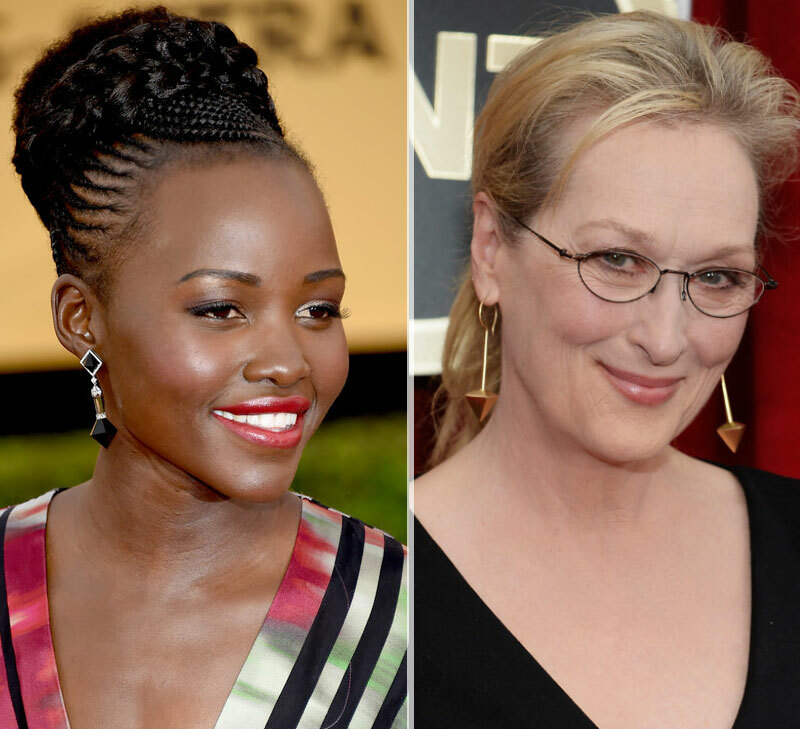 Meryl and Lupita Nyong’O were the only two ladies I decided it’s worth writing this column even this late! See also: The Golden Globes dresses! The beautiful and talented, the magnificent Meryl was rarely pulling a fashion faux pas, but the simple elegance of her outfit is enough to measure the class of the wearer! Meryl is one of my role models in so many ways! 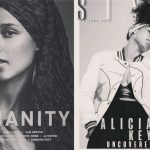 She’s so very inspiring and brave! The same goes for Lupita Nyong’O who seems to be fashion’s darling on and off the Red Carpet, proving her style status with every new official event she’s attending! This time, she opted for a striped Elie Saab gown. So unlike the Elie Saab dresses we’re used to seeing – there was no sequin, no lace, no unnecessary trimmings, just sheer sartorial elegance. Notice Lupita’s new hair? Her hairdo is just as much part of her style as any other gown she’s wearing and I think that’s fantastic! Jennifer Aniston started showing off her neck-to-belly-button cleavage on the last Red Carpet when we thought it was accidental. It is not. History repeating is exactly how you turn ‘accidents’ intro trends. There’s no telling what prompted the Friends actress to dress in a Spring 1998 Galliano design which was actually qualified as ‘vintage’ – really? Who’s been joining the cleavage trend? Rashida Jones, in a playful Emmanuel Ungaro, Sarah Hyland in a lovely yet strange Vera Wang number, Julia Roberts in a Givenchy jumpsuit , Amy Poehler in a blue Jenny Packham dress, Maggie Gyllenhaal in white Thakoon and even expectant Keira Knightley who was praised for her Erdem purple dress. See also: Celebrity trends we can actually follow! 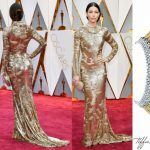 More ladies were also showing off their cleavage all the way down tot their waist: Vitalie Taittinger, Gwendoline Christie, Stephanie Beatriz, Alex Hudgens – I’m sure there were more, but I think these examples are largely enough to convince you of the cleavage trend! What did Julianne Moore, Patricia Arquette and Andrea Riseborough had in common besides winning an Actor at the 2015 SAG Awards? They all wore green dresses! 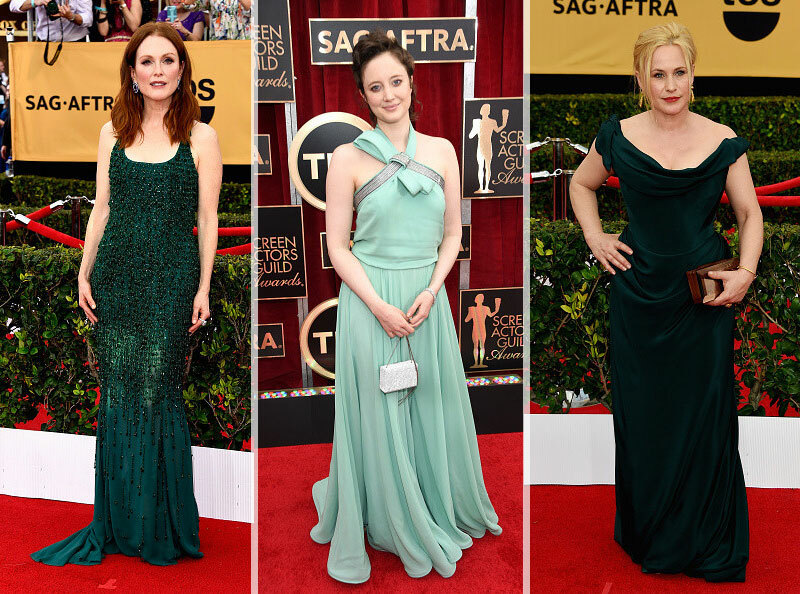 Sure, I do prefer Julianne Moore’s Givenchy number as opposed to Andrea Riseborough too washed-out mint green dress, but even so I do get the general green-win outline! 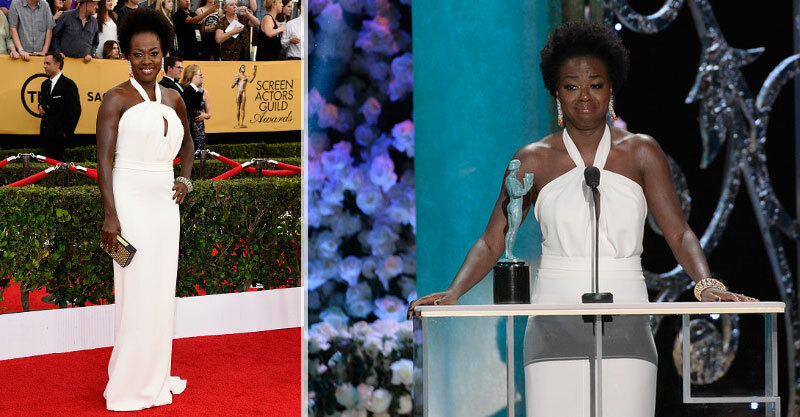 A special mention for Viola Davis in a Max Mara dress who still got an actor, even wearing white! See also: What nails colors are hot on the Red Carpet! Hybrid dresses are are so in! You know that weird moment when you can’t really tell what went through the designer’s head when he or she designed a specific gown? Well, contrary to the general opinion, Emma Stone’s Dior felt unfinished to me. Something was off in her look. Like she was wearing her father’s jacket over a night slip? Laura Carmichael wore a similar design from the Spring 2015 Vionnet collection while Anna Chlumsky definitely found her Escada dress ‘Into the Woods’ as worn by one of those fairy-tale characters, just like Melissa Rauch who was dressed in Pamela Rolland. See also: 70s style as worn by Jennifer Connelly! Julianna Margulies, although opting for a gorgeous blue dress, the Giambattista Valli Couture design of the gown lead me to believe that she had pinned her dress to her belt for a safe passage on the Red Carpet! Same goes for Sophia Bush whose Vivienne Westwood dress also looks tweaked at the waist for a more comfortable walk. 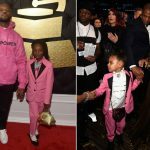 Have you seen Lorelei Linklater’s Honor dress? Or Rosamund Pike’s Dior? Or Naomi Watts’ Balenciaga? Dresses meant to be extraordinary but ended up looking less than ordinary and frumpy. 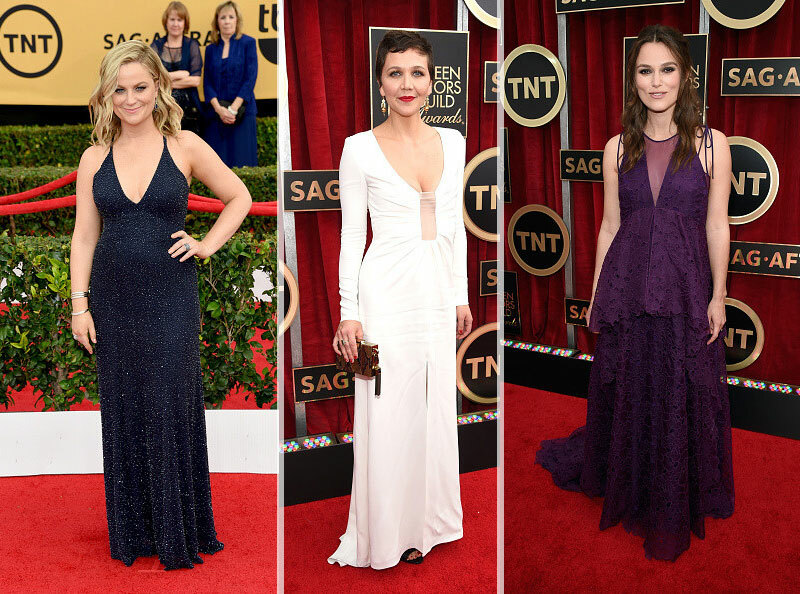 These were a handful of the dresses seen on the 2015 SAG Awards Red Carpet – I chose to discuss them because they felt so unnaturally boring. However, I’m open to suggestions and new perspectives, so if you have something or someone you think was really worth all the style praise, please do tell! I just love Lupita’ style choices! Her gown was stunning and so was the sister dress that she wore to the after party. They were the same material but very different styles, and of course her hair was lovely! Meryl looked great, as did Emma Stone and Rashida Jones, and it was really a nice surprise to see Jennifer Anniston in something not black. I am not a big fan of the big cleavage V but she wore it well. Everyone else for me was rather just okay.